New Caledonia’s 1-1 draw with Fiji at Stade Fautaua this afternoon sees them join Group B leaders Solomon Islands in the semi-finals of the OFC U-19 Championship thanks to superior goal difference. Solomon Islands confirmed their place at the top of the pool after a narrow 1-0 victory over Vanuatu in the day’s opening encounter. New Caledonia knew they had a tough match ahead of them against Fiji, not only because of the earlier kick-off but also because of what was at stake. “We expected it to be difficult today, we expected it,”coach Felix Tagawa said. “We were shooting, we were creating and we were playing with the ball. We had chances and didn’t put them away. It wasn’t an easy encounter for either side. Both teams went in hard from the outset testing the physical resolve of their opponents, with one of the earliest cautions of the tournament coming for New Caledonia when Josua Hmelu went a bit too far for New Zealand referee Nick Waldron’s liking. Fiji were forced to make an early change after Sekove Naivakananumi picked up an early injury. The change was made in the 12th minute and by the 17th New Caledonia were also having to look to the bench for an injury replacement with Cyril Drawilo coming in for Jean-Baptiste Caroine. Following the changes the match started to flow a bit better and the two teams started creating some more likely chances. In the 25th minute Pierre Bako put up a thunderous free kick which forced an excellent save from Fiji’s goalkeeper Mohammed Alam. While to fans it looked like the better chances of the first half flowed in New Caledonia’s favour, it was actually the Fijians who broke the deadlock. Goalkeeper Une Kecine made a fine stop on the initial shot but didn’t hold on to the ball, it wasn’t out allowing for a cross to be cut back across the face of the goal for Ratu Dau to finish. With the goal coming in the 45’+2’ minute it seemed New Caledonia would have to wait until after the break to find the equaliser, however when Paul Gope-Fenepej was brought down in the box and Waldron pointed to the spot. Drawilo, the author of two penalties against the Solomon Islands in New Caledonia’s opening match, stepped up to take once more but was left devastated when keeper Alam halted his effort. Coming back in the second half, the pace and ferocity hadn’t waned at all with both teams continuing to apply pressure. Gope-Fenepej had raft of chances to find the equaliser with one flying just over the cross bar and a 1v1 with the keeper just failing to find the back of the net. The break New Caledonia were waiting on finally came in the 62nd minute when Drawilo made up for his earlier mis-step but putting the finishing touch on the equaliser. 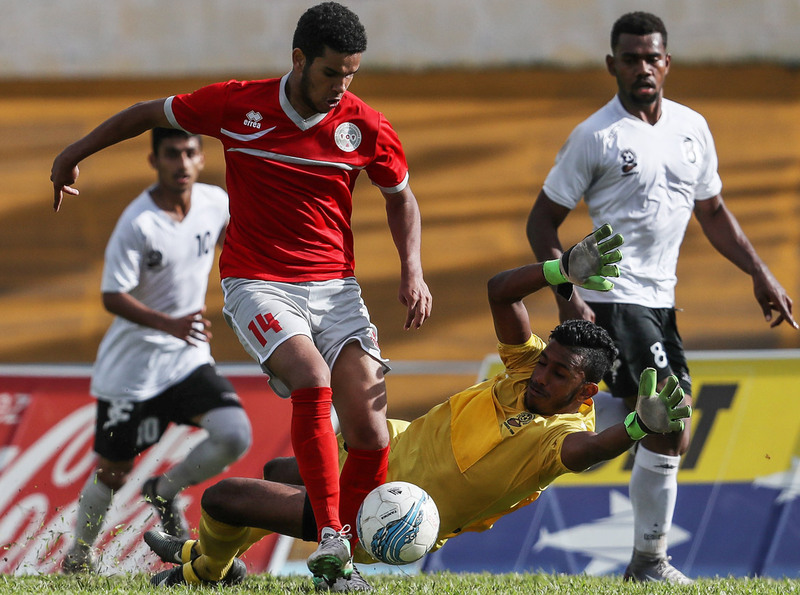 Neither side seemed content with a draw, although for New Caledonia it would be enough to progress, continuing to push their opponent right up until the final minute. Fiji coach Bal Reddy said it was an incredibly disappointing way to end the competition especially with his team having performed well throughout each of their three matches. “Overall we’re disappointed, we wanted to qualify,” he said. “The start was good but conceding that goal killed our spirit. If we had scored the opportunity at the start of the second half that would have killed off New Caledonia, but unfortunately we couldn’t,” Reddy explained. For Tagawa the match could have easily slipped from his side’s grasp against a strong, determined Fiji team. “At times it felt like maybe it would be one of those days where nothing goes your way but we really couldn’t think like that,” the New Caledonian said. Already assured a place in the semi-finals, Solomon Islands entered the match a step off their usual form. Coach Batram Suri made some changes to his starting lineup leaving some of his first choice players on the bench. It was an evenly-contested match where any clear-cut chances were limited by both teams’ defensive players. Solomon Islands closest chance early on was a free kick by central defender Aengari Gagame in the 13th minute. However the defining moment of the match arrived two minutes later as Patrick Taroga leapt high to meet a corner delivery and head it into the net. The scoreline remained at 1-0 at half-time as both teams went into the sheds with plenty to ponder. Vanuatu’s best chance of the second half saw Jordy Tasip go up against Joel Nanago only for the final effort to go off target. Making matters worse for Vanuatu, Zidane Maguekon received a red card with 15 minutes remaining, making the task even tougher for the team. Solomon Islands substitute Simon Jedzini had two good chances to score when his side had the numerical advantage, however he fired off-target. Despite being a man down kept pushing their opponents but they held strong until the final whistle to earn the 1-0 victory. The win means Solomon Islands topped the group with nine points from three wins to set up a semi-final with hosts Tahiti. Suri was pleased with his team’s overall performance as they walked away with another important win in the tournament, but felt they could have done a bit better. “Well with the performance in the first half we didn’t perform because the wind was against us,” he said. “The boys kept on going to at least score a goal that made us win the game. The first was not good but we came back in the second half to play a bit more. Vanuatu coach Kaison Maki expressed his disappointment at not making it to the next stage of the competition. “I think we learned a lot, the players and coaches, especially the technical team,” he said.